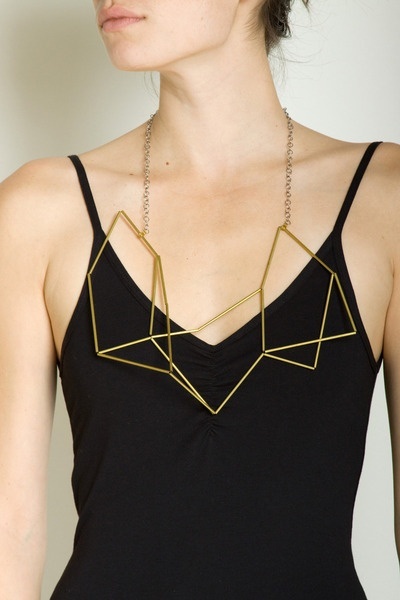 Geometry, formulation and coordination are words not commonly associated with jewellery. The moment we utter the term 'bling' we gear our subconscious thoughts towards a heavy set chain and cluster of diamonds. But with geometry? We presumably associate the term with academic curriculum of math and science. 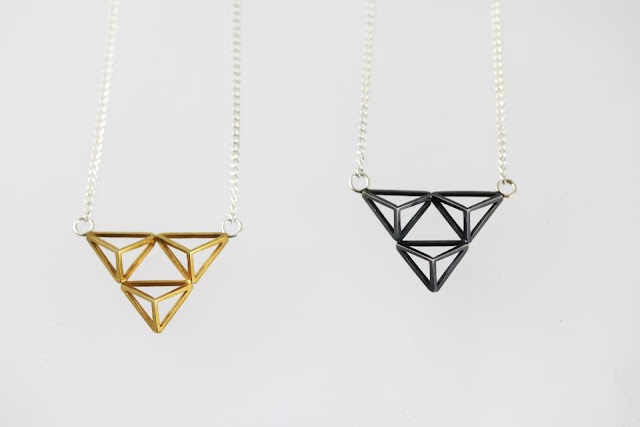 However, the geometric trend within the jewellery industry and indeed fashion has never been so influential and powerful with jewellery designers continually experimenting and forever questioning the mathematical attributes in jewellery. The combination of math, art and jewellery is a delightful concoction that will continue to inspire, delight and most importantly, break down barriers and create new ideology. "These pieces are designed technically and customer must feel that there is a mind behind the reason and that translates all this into a gem." His work subtly implies mystery and timelessness with daring elegance. Although his pieces are ideally worn, it would certainly not look out of place on a plinth in a contemporary art gallery. His designs are to be admired but thankfully without the 'do not touch' sign. "My work is an exploration of these structural forms - building up a single line or shape into a dense mass, or distilling forms into their skeletal supports. All of my work revolves around crystalline growth: I am fascinated with the way that something made purely of hard edges and angles can grow as organically as a flower. 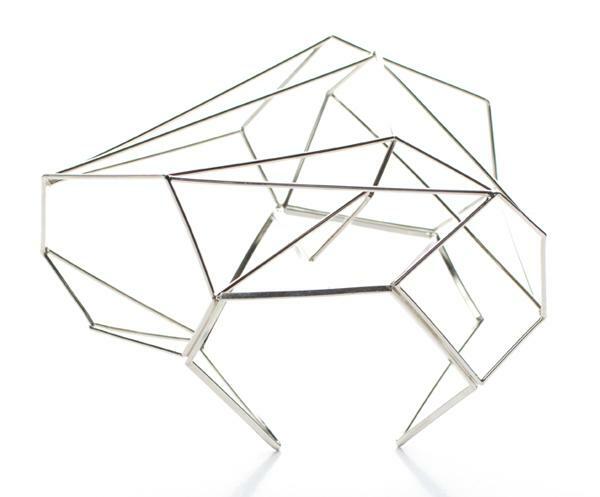 I mimic crystalline formations in my jewelry, constructing simple wire forms into hard-edged, slightly chaotic structures." 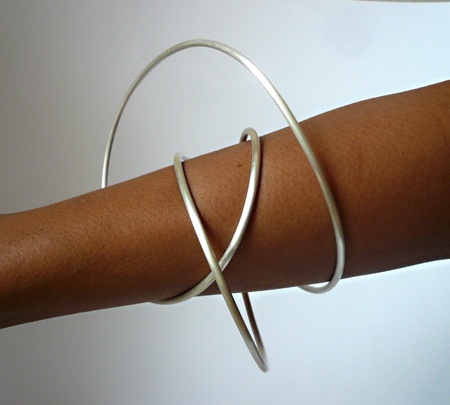 "My interest in jewelry as a medium of art is its site – the body. 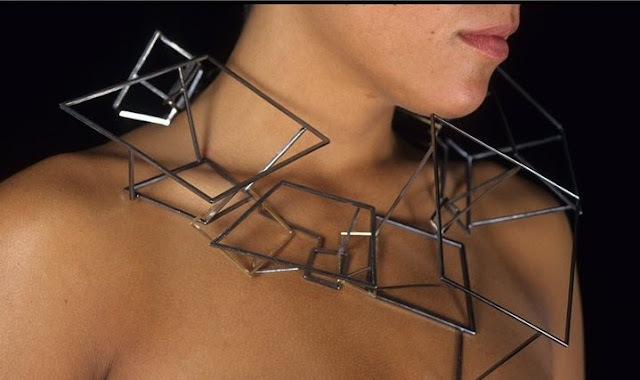 Much like the function of architecture to house, display and protect paintings and sculpture, the body acts as literal, metaphorical and conceptual structure for jewelry. Placed on this site jewelry acts as a personal signifier of taste, attitude, belief and history." "I would describe my work as contemporary small scale structures for the body. I source my inspiration from strong architectural structures and landmarks. My degree show collection "Dundee Rigged" was inspired by the locally docked rigs’ legs. I was able to get some great pictures of the rig legs and work from them and visit the docks frequently for reference." German-born jewellery/artist Ute Decker's stunning spatial collection is an exploration of space, beauty and ethics with her preferred material of recycled silver, bio-resin and fair-trade gold. Her journalistic and economical background came into fruition as it influences her ideology and context relating to society and our surrounding environment. Her underlying dismissal of conspicuous beauty and perfection is applied with her deliberate application of visible marks when forming, soldering and bending the pieces to depict our human characteristic flaws and exterior imperfections. Additionally it highlights the media obsession with the perfect human form and the lack of focus on human achievements, intelligence and personality. "It is important to me that the beauty of my pieces is not only on the outside but is an integral part; from the mindful choice of the materials’ provenance through to the careful hand-crafting of each individual piece. Beauty as a material version of ‘goodness’ can remind us about the qualities to which it alludes, such as love, trust, intelligence, creativity, kindness, justice and courage. By having such works around us, we can be subtly reminded of the constituents of virtue." 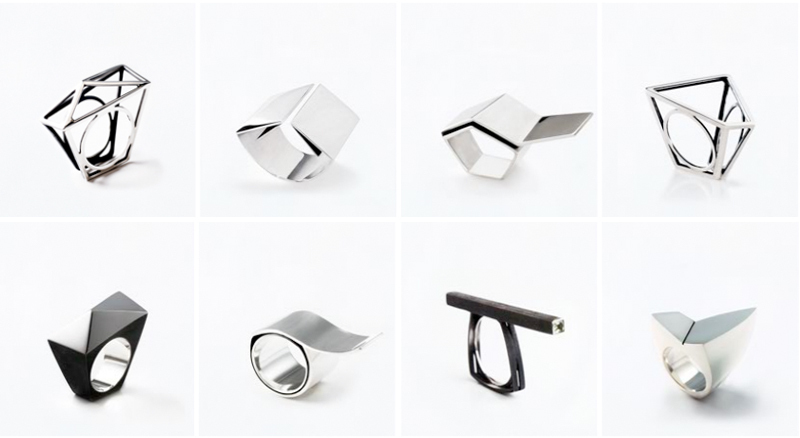 Cockpits Art resident jewellery designer Mariko Sumioka work is inspired by Japanese architecture, old traditions and the spirit of Zen. 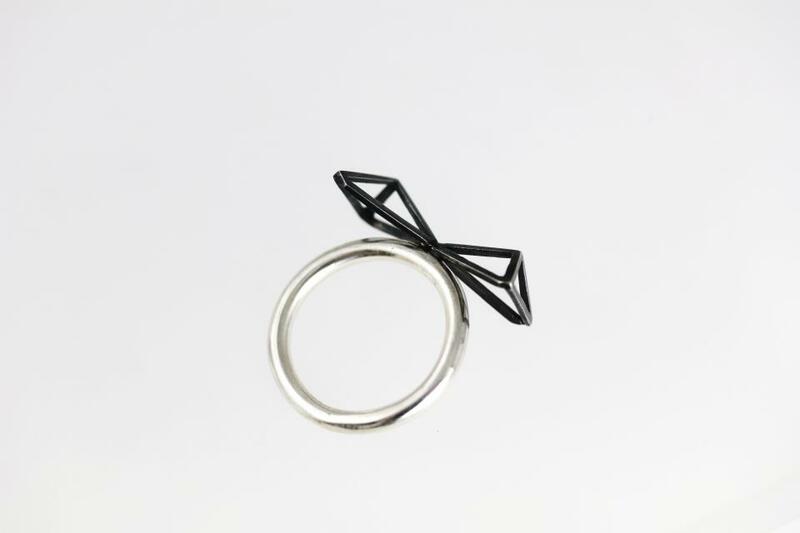 She explores the concept and narrative of jewellery and encourage individuals to find their own connection and story whilst wearing her jewellery piece. 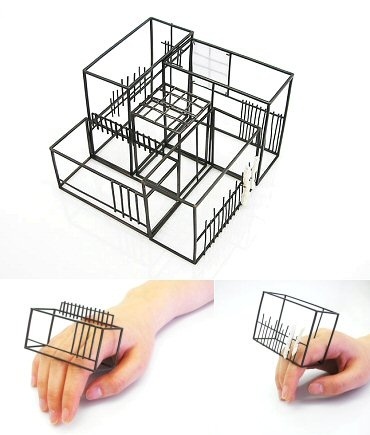 The perfect structure of a japanese-inspired housing layout adorning the hand is an instrumental symbol of possession, personal comforts and cleanliness. natural materials and colours, dark and bright contrasts, linear forms, geometric shapes and spaces. Since human beings live in architecture, there are some reasons in each element. I have researched theoretically and visually into those handed down traditions and tried to bring them into my pieces of jewellery. 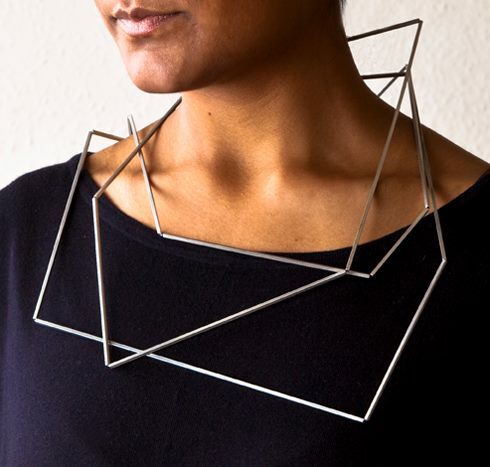 My work explores a connection with human bodies and how the wearer and viewer interact with each other, themselves and the objects. Also, studying the principle of Zen and the essence of the Japanese love of nature helps me to understand peoples attitude behind their culture." "I'm fascinated by perfect shapes, like a triangle, that can be idiosyncratic and almost weird-looking when repeated." Hanna's work has various means of symbolism; it could possibly question individuals excessive needs of opulent lifestyle and accessible luxury in their lives; creating a false sense of identity and temporary happiness. By delving into our humble beginnings, simplier and finer objects can be a source of personal gain and not a source of what we are missing. 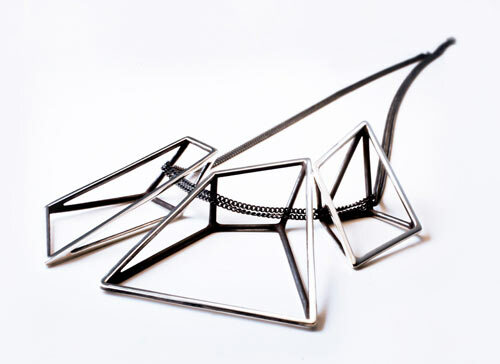 German jewellery designer Ariane Ernst inspiration comes from current fashion trends and art movements of minimalism and deconstructivism. She uses flashes of colours and boldness whilst maintaining her focus in proportions and fine organic lines. 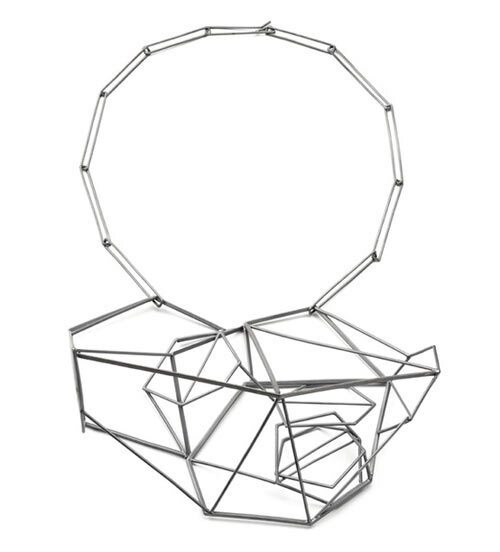 Her work has a sense of purpose; to demystify jewellery from only being viewed as a piece of accessory; but a form of expression of the individual's character and personality. "Each piece is based upon a broad conventional style. In particular she puts her focus on proportionalities and the joint lines of each single link. In this process classical forms of jewelry collide with the latest trends of fashion – colours, stylishness and her classical education influences her jewelry design." Her promotional images of the collection depicts strength, spontaneity and adventure; it could possibly describe the wearer than the jewellery itself, or a combination of both. The collison of geometry, art and jewellery are an addictive mix and never to be concluded. We hope.